With a posh interior, space to spare, and plenty of power, the Armada has everything you need for your family adventure. The first thing you notice when you hop into a new Armada is all the bells and whistles that come standard, all of which make a weekend warrior a much more efficient adventurer. The 8" touch screen display and voice activation system allows you to find your next adventure easily, and even check the forecast before you decide to set up camp. The Bluetooth phone system, activated on the steering wheel, lets you stay in touch no matter where your journey takes you. A Bose 13-speaker sound system ensures that your audio experience is nothing short of spectacular. The 8-way adjustable seat and adjustable pedals makes sure that your car fits you. It's the small things that often make all the difference, especially when you're making your vehicle a second home. 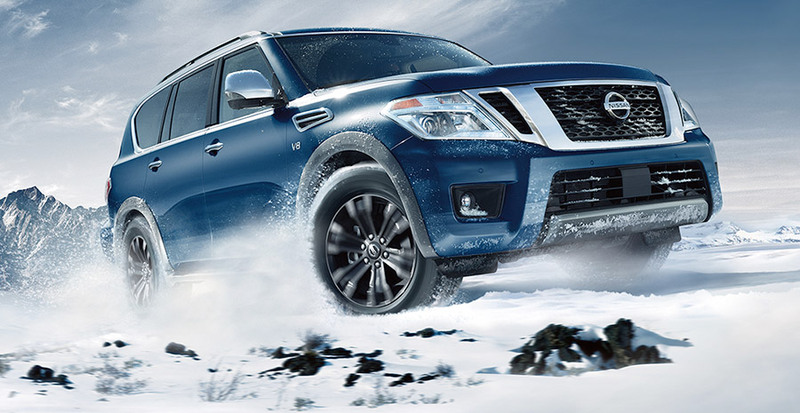 Rather than having to spend extra o these features, Nissan has made the Armada comfortable and well-equipped for any expedition you might embark on. When you're going camping (or boating, or roadtripping, or vacationing…) with your family, you need room for you and your gear. The Armada provides a 3rd row of seats, which can fold down for extra cargo room, so you can comfortably seat 8 passengers or a truckload of cargo. For your winter trips, the standard (!) leather seats are heated front and rear. The second row captain option gives even more comfort with a center console, which can be easily removed and replaced, and the ability to recline. And, if you are traveling solo, that second row of seats can also be folded down to provide a combined 95+ cubic feet of storage. And if your 95+ cubic feet of storage still isn't enough, the 2017 Nissan Armada sports a 5.6 liter V-8 engine that provides 390 horse power and 394 ft-lbs of torque. To put it a different way, the 2017 Nissan Armada has enough power to pull a trailer, with a max tow capacity of 8500 lbs. It also comes equipped with a towing mode so that you still have plenty of get up and go when towing a load of any size. Of course, if it can pull a trailer, it can pull whatever you might need for whatever family adventure strikes your fancy. Pull your jet skis, boat, pull behind camper, or whatever else you can imagine to comfortably equip you and your family. When your trip takes you off-road a little, you'll have no problems, because the 2017 Nissan Armada has enough clearance to tackle the challenges of the open road. The all wheel drive, traction control, and active brake limited slip system, which slows down wheels that are spinning out and applies more power to the wheels that have the best traction, ensure that you will be in control the entire time. In the (un)likely event that you're about to proverbially "bite off more than you can chew" in the terrain department, the front and rear sonar system will let you know. This alert system is also handy when whipping this beast into a parking space, because not every challenge of the open road comes in the form of a mud bog. Sometimes, the biggest challenge is the Target parking lot. The Platinum edition of the 2017 Nissan Armada piles on the safety features. Along with the front and rear sonar, anti-lock brake system, traction control, active brake limited slip system, and an airbag system that extends all the way into the third row, additional features in the Platinum warn you if you are approaching the car in front of you too closely or quickly and will even apply the brakes for you. Add the lane departure warning and prevention that will help you get back on the road when you're accidentally heading off-road and the blind spot warning and intervention to the already stellar Nissan safety package and you'll drive with confidence that your crew of suburban commandos are safe and secure. While safety is awesome, we're pretty sure that the real charm of the Platinum edition comes in the Tri-zone Entertainment system. Through the 7" monitors and Bose sound system, you can play movies, plug in your video camera to relive your adventure, and even hook up your video game system. This perfect edition will keep even the longest road trip a pleasant adventure for all. Leather heated captain's chairs can both recline and be stored for extra cargo room. Built into the front headrests, entertainment system allows passengers to play movies, plug-in devices, or hook up gaming systems while on the go. The 2017 Nissan Armada is the SUV that meets all your outdoor needs without forcing you to lose any interior comforts. The smooth ride, comfortable and spacious cabin, towing power, and posh interior make it the perfect choice for the adventurous family. On or off road, on the move or on your commute, the 2017 Nissan Armada gives you the best of both worlds, adventure and refinement, combined with a package of standard features that will turn anyone's head.